Ugh - that poly S trap and down pipe was the worst. We live in an amazing 1973 Pettit and Sevitt home right on the edge of Lane Cove National Park; and although we love the wood cabin feel, there is plenty of room for improvement - to lighten things up a little, and add our own more modern stamp while staying true to the intent of the style and keeping as much wood as possible. 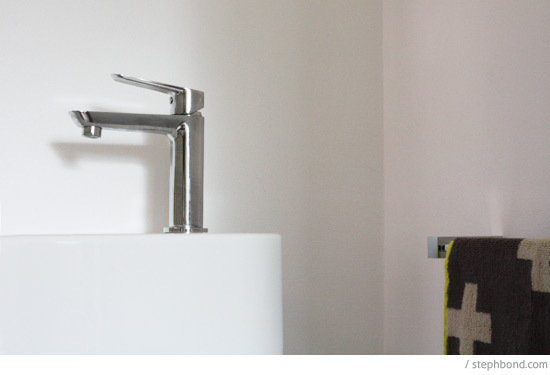 Rather than spend a lot of money on plumbing, we decided to keep the position of the sink plumbing, and the toilet. The quarry tiles are original to the home, and we decided to keep them too. Everything else had to go! Big change! 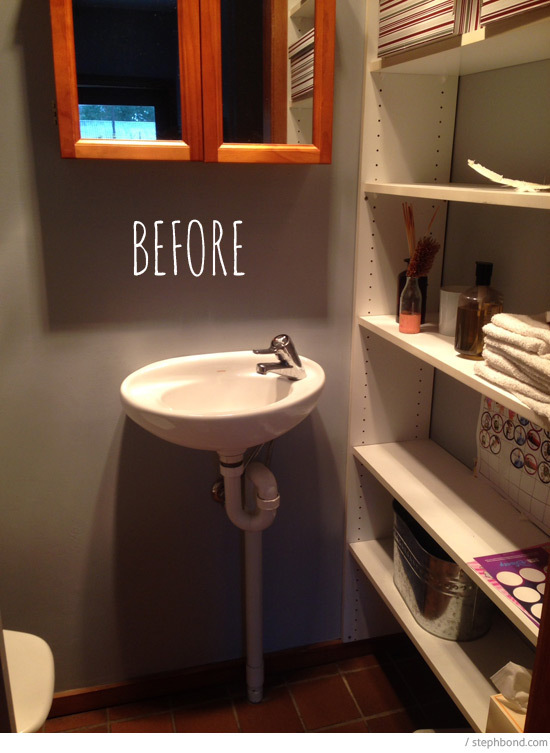 First of all, we removed the shelving and installed them on the other side of the wall in the cleaning cupboard to store paper products and cleaning products. That gave us more space but revealed the patchy paintwork underneath. Everything was sanded back and painted Dulux Vivid White and the doorway was re-stained. Next up was a new chrome S trap and down pipe from Reece. 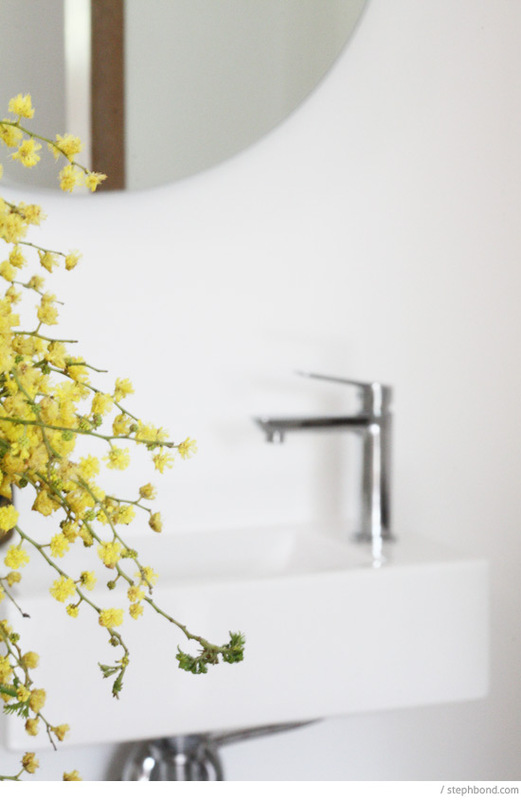 And then of course while we were at Reece we fell in love with a more modern basin and had to have it. 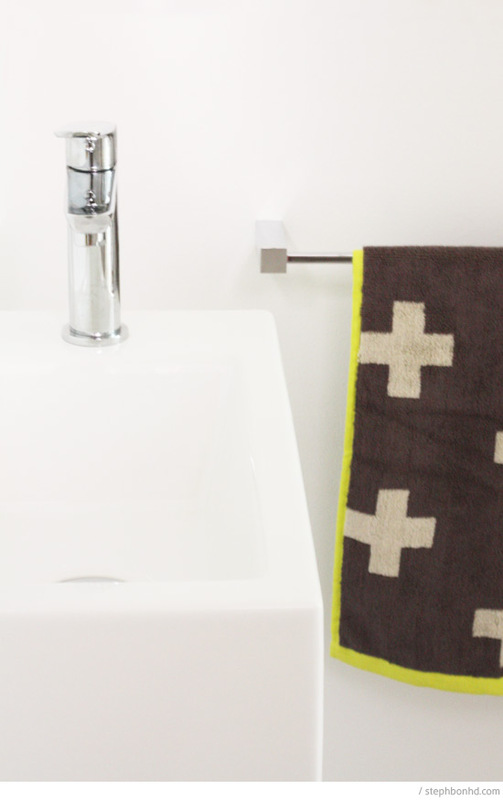 This is the White Stone Hox mini basin and the Milli petite basin mixer. 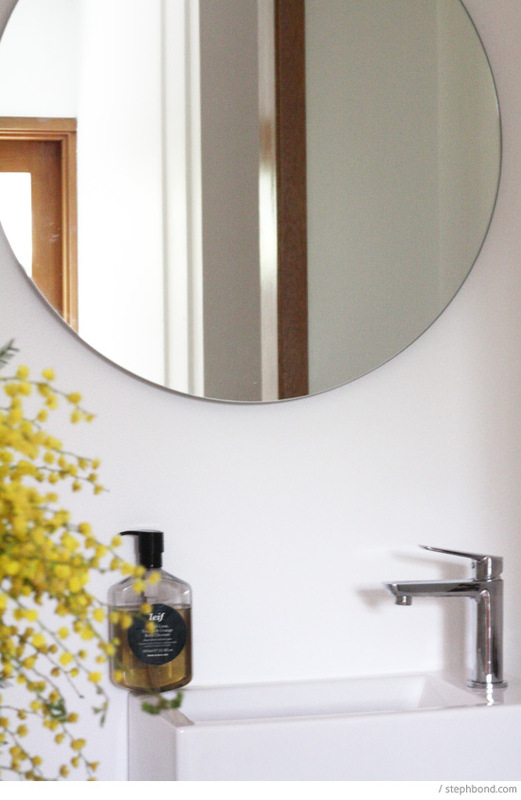 The hand soap is from fabulous Australian brand Leif which looks and smells great. 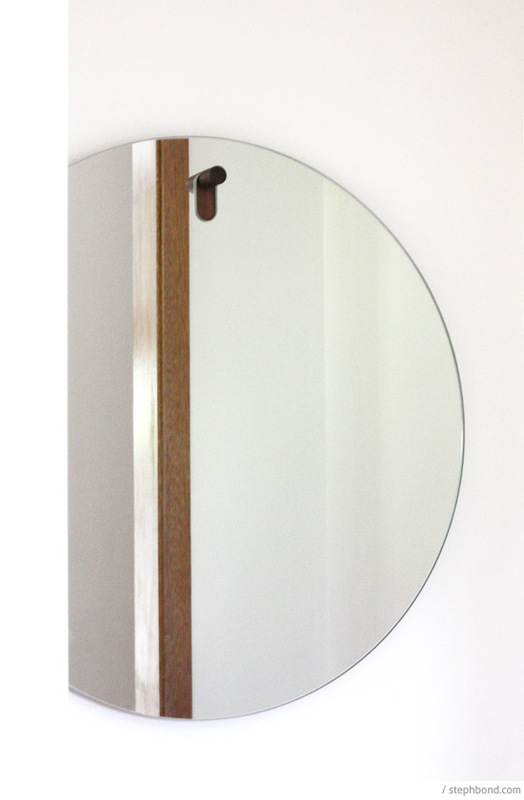 For our wedding anniversary, we gave each other the Bludot round Hang mirror which I am in love with. 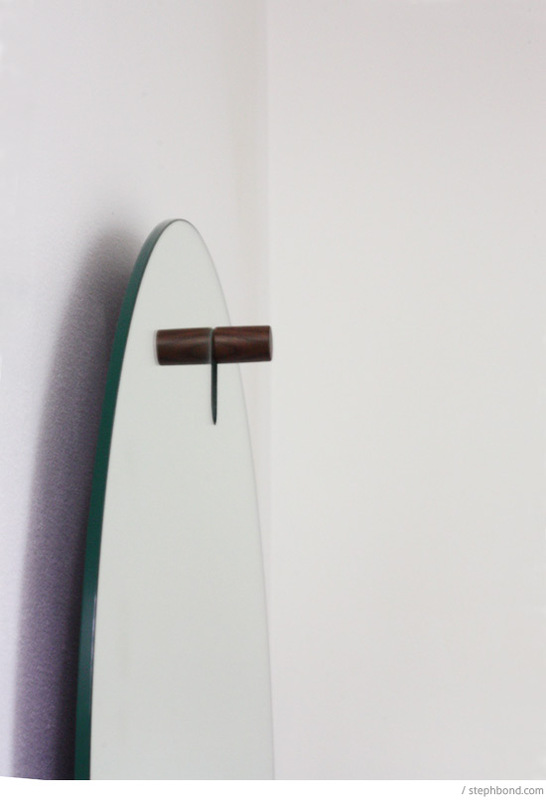 It hangs beautifully on a wooden 'peg' and brings a little timber into the now-white space. 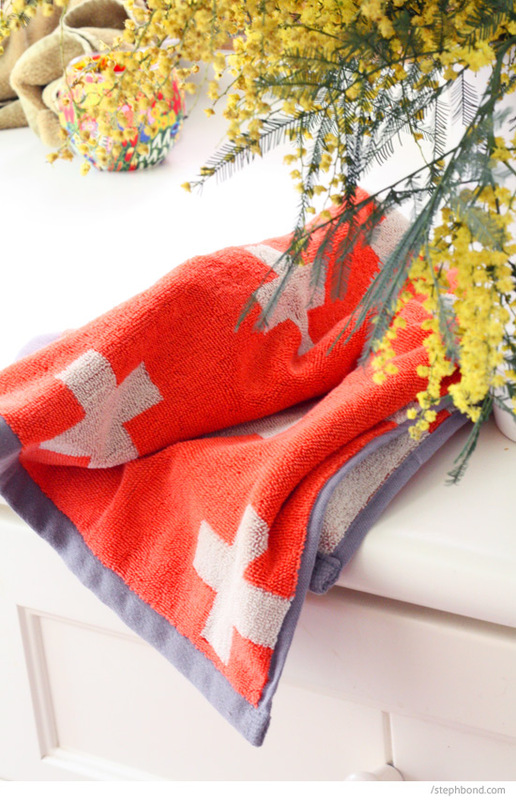 The cross hand towel is from Aura by Tracie Ellis; I love the neon yellow edging which looks great with the golden wattle from our garden. 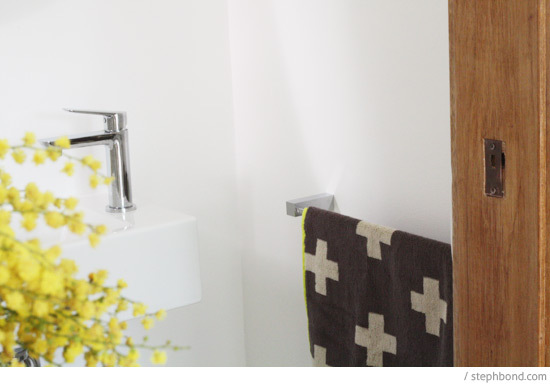 The towel rail is the Mizu Bloc design, also from Reece. 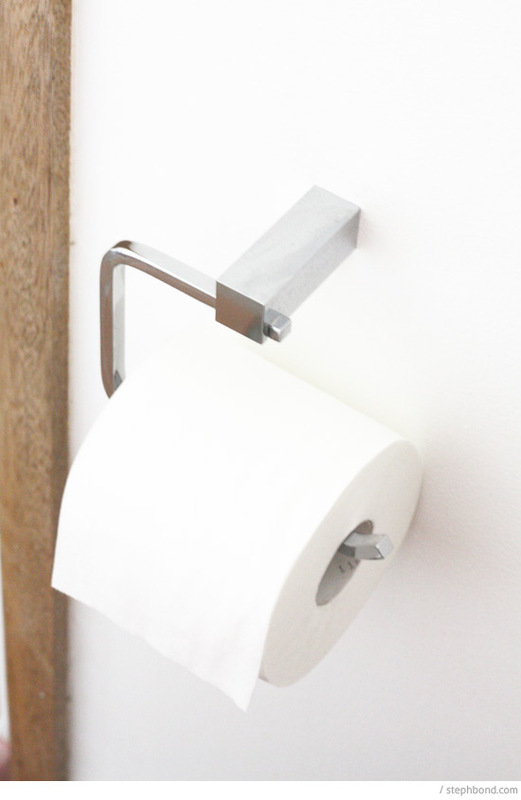 The toilet roll holder desperately needed updating from white plastic to this polished chrome Mizu Bloc squared-off design (also from Reece). 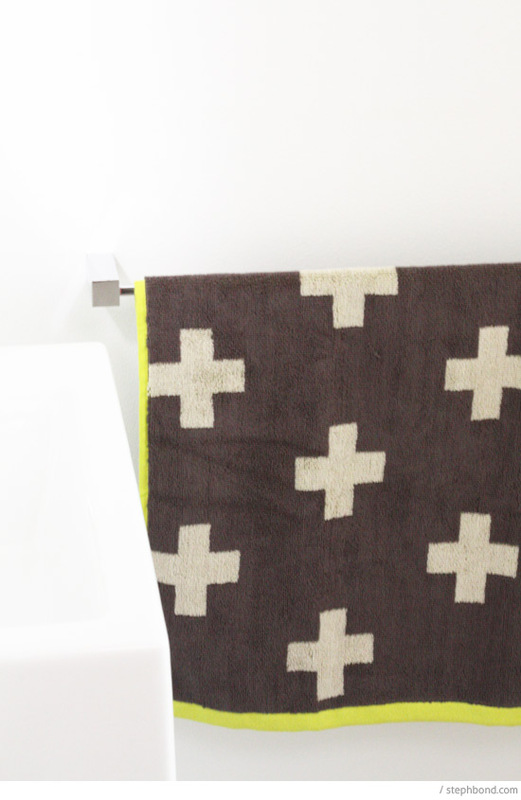 The orange cross Aura by Tracie Ellis hand towel suits the space perfectly, too. We had to keep the kitsch-cute brass Loo sign from the previous owners. 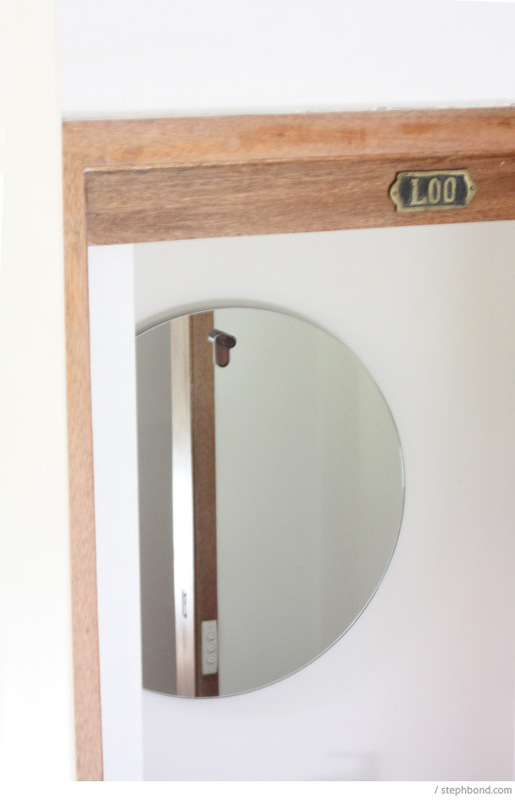 Finally, we removed the old timber skirting board trim and stained and installed fresh new trim, and added a more modern soft-close toilet lid from Bunnings. 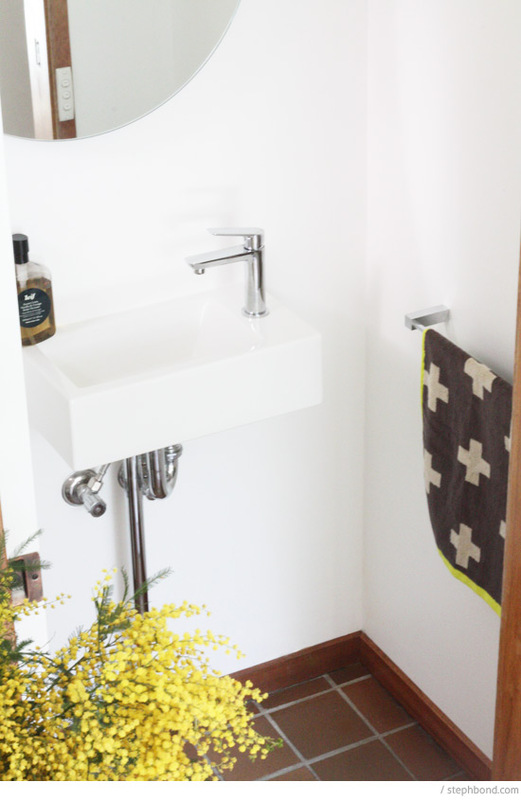 And after much deliberation and hard work (mostly from Harris), we now have a bright, airy, compact bathroom. So great! 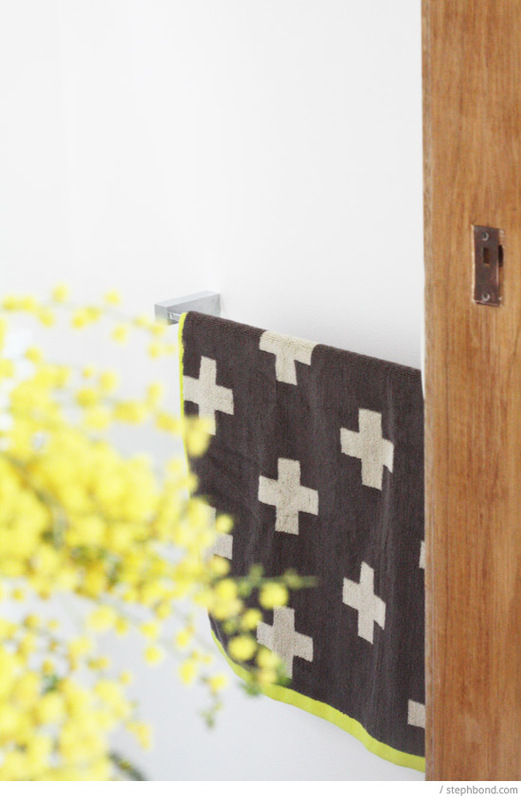 There's lots more still to do around the house, but we will revel in our first project for a while (although now of course I want to get stuck into the kitchen). Are you in reno heaven or hell at the moment? This looks brilliant Steph!! Well done. Did you do all this by yourself? You're amazing!! We're relying on trades to do most of our reno. So sloooow. Looks gorgeous Steph. Love your choices. Are you down the road from me now?? Lexi - thank you so much! Linda - Harris and I were the DIY team! I stained, purchased, picked up, decided, and had the vision. Harris did all the plumbing, electrical, painting, sanding, installing, measuring and everything else! 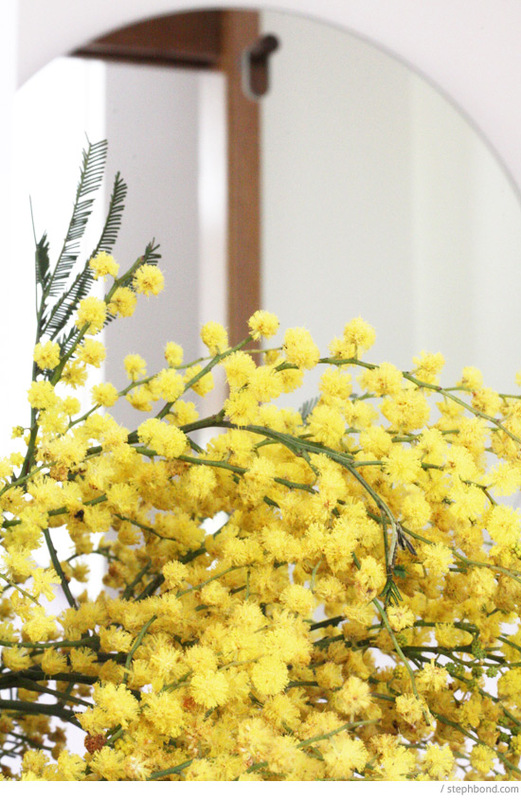 @Kate - thanks lovely! We're in Cheltenham, so at the very far edge of LC National Park. I wonder if we could walk the tracks from our place to yours? hmmm... my comment disappeared. Great job Stpeh and Harris, it looks so much better. I love that mirror SO much! Wow that's really great renovation work. It really looks amazing now. Thumbs up.